Sportydad joins the boxing world in paying tribute to one of the world's greatest boxing champions. He reigned in my days of youth, at that time when I was still starting to appreciate the sport of boxing and starting to idolize great boxers. There were no cable TV's then, no live feeds, not even replays. I just read their exploits in the sports pages but somehow I was able to know them. It is only now that I've got to see them fight because nowadays, a number of TV channels have programs featuring old boxing matches. But I saw Smokin' Joe's first fight with the great Muhammad Ali at the famed Madison Square Garden, then the mecca of great boxing fights, in March 1971. That fight, dubbed as The Fight of the Century, was shown in Ever cinema in Guanco Street in Iloilo Calle Real, then Iloilo's Escolta. I could not forget that left hook Frazier unleashed in the 14th or 15th round, which knocked down Ali, the first and I think the last time ever that Ali fell to the canvass. That crushing left hook, Frazier's trade mark, won him that match. Of course, everybody know what happened to their next two fights, especially the historic 3rd and last match, Thrilla in Manila in September 1975, considered by many as the greatest boxing match of all time. Joe Frazier embodies the heart and fighting spirit of a boxing warrior. He never wavered nor retreated. From the first bell to the last, he comes in charging, never afraid, never intimidated. That's how he got his tag name, Smokin' Joe. At 5'11" and weighing just over 200lbs, he was quite small for a true heavyweight. Ali was 6'3" and comfortably fought at 215 to 220lbs.But Frazier compensated this by his never ending attack, ducking, weaving, in the process absorbing those hard jabs and straights.He fought at close range and barrels his way through for his vaunted and feared hooks. He knocked out many of his opponents by those deadly left hooks. Only Pacquiao can match the deadliness of that left hook which could send opponents to dreamland by just a single blow. I pitied him in his 2 fights with that destroyer named George Foreman. Frazier was simply no match to this big man who wallops killer punches where many of his fights ended just in one round. But he never retreated. Shame on those boxers today who fought only for money and fought only to survive and protect their bodies from bombardment. 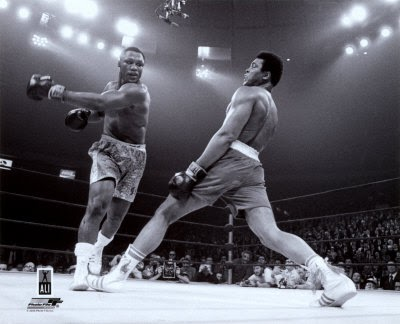 Of course, talk of Joe Frazier would not be complete without mentioning Muhammad Ali. Together, they symbolized the glory days of boxing, even if their animosity was carried outside the ring. Ali won the 1960 Rome Olympics Heavyweight title; Frazier followed with the 1964 Tokyo Olympics and Foreman next came in during the 1968 Mexico Olympics. All Olympic Champions. all world boxing champions. In the end though, Ali and Frazier, Frazier and Ali made peace with each other. Smokin; Joe Frazier will remain the idol of my youth!